We play doubles croquet (2 vs 2) on Tuesday, Wednesday, and Thursday nights. On Saturday mornings we play singles croquet (two player play head to head, each one playing two balls). Our regularly scheduled games for the summer series begin in June and run through August, then we begin our autumn series of Fall Ball. The autumn series is great entry point for folks who join our club when the summer leagues are already in full swing. The season is punctuated by a parade of parties, clinics, tournaments, and more. 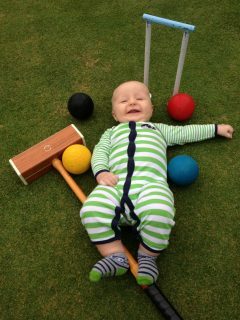 The Milwaukee Croquet Club will be hopping this summer, so jump on in! A few of us know what we’re doing, but most of us are fairly new to the game and simply enjoy getting outdoors for some low-impact and low-stress competition and camaraderie. Stop by the lawn bowling clubhouse with the green and white awning next to Lake Park Bistro for some genteel croquet fun! We’ll get you out on the green, show you how to swing a mallet, and have you running wickets in no time. You should wear flat-soled shoes to protect the lawns (no heels, please) and white or light colors, as you don’t want to feel out of place in your tie-dye romper. Opening Day Social Play and Potluck Sunday, May 19, from noon until 3:00 p.m. This is a great event for learning more about the club, learning how to play, and getting some experience swinging the mallet and scoring a few wickets. Friday Night Social Parties (every second and fourth Friday, June – Sept.) June 14 and 28 July 12 and 26 August 9 and 23 September 13 and 27 Swing by at 6:30 p.m. on these Friday nights to meet some friendly folks, eat some snacks, enjoy some beverages, play a bit of croquet in a casual setting, and then enjoy a dinner of sandwiches or pizza before playing some more or pouring another glass of wine. The parties are included in our members’ dues, but we ask visitors for a $5 donation per person. Membership has its privileges, so sign up now to enjoy the parties. Tuesday, Wednesday, and Thursday doubles leagues begin June 11, 12, and 13 One-hour games begin at 5:00, 6:00, 7:00, or 8:00 p.m.
Did you miss the sign-up for the summer league series, but you want to get more practice and games in than the Friday Night Socials provide before you sign up for the autumn series of Fall Ball? 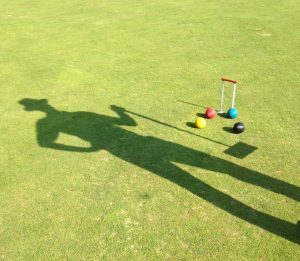 Our new series of Croquet Clinics are designed to give new members and players who want to brush up on their skills an opportunity to warm up before Fall Ball. Led by USCA-certified instructor Cheryl Bromley, who is a top competitor at national and international tournaments, these clinics promise a warm welcome to the game and a solid foundation for fun and success. The confidence and skills you will gain will be well worth the nominal fee (TBA) for Cheryl’s expert guidance. Family Nights, certain Friday nights, 6:00 p.m. – 8:00 p.m.
$25 per family per night or $100 for all five, with Friday Night Social privileges for the parents. To preserve a tranquil setting and to promote the focus our player need to play the game well, our club is generally an adult space. The need to protect and respect our manicured lawns and our equipment also recommends limiting children at the club. But we recognize that the children are our future, and that area parents may enjoy a night on a croquet lawn with a mixture of their kids and other adults. To that end, we are inviting families with well-behaved children age 7 and up to join us for a series of Family Night events. We’ll provide the high-end equipment and instruction for you to experience the joy of “real” croquet with your loved ones. We just ask that you provide close supervision of your children, as the lawns and the mallets can be easily damaged, and our solid metal wickets can imperil children who become rowdy or careless and trip over them. Our hope is that parents will enjoy this familial introduction to the game and decide to join the club to take advantage of the Croquet Clinics, the Friday Night Socials, and the autumn series of Fall Ball. We also harbor hopes that some area children will take to the game, eventually join the club in their own right, and pursue the path of a phenomenal 11-year-old in California who is a doubles national champion, having bested extremely accomplished adult players. There may even be a scholarship in it for your kids if you’re OK with them attending Oxford or Cambridge in England! August 17: Fall Ball begins! Contact Nels as listed below for a packet of information regarding this season’s upcoming events and a sign-up sheet, which is your key to a wonderful summer of good games and fun socials with good and interesting people (like you)! You can stop by and check us out in action during our 60-minute matches, most of which start at 6:00, 7:00, and 8:00 p.m. on Tuesdays, Wednesdays, and Thursdays. 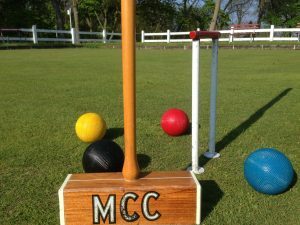 You’ll see some of the most exciting croquet action in the state, and there will be members on hand to answer questions. If time allows, we may even get you out on the green for a wicket or two! If you can’t make it to the Tuesday, Wednesday, or Thursday night events, somehow miss the Friday night social parties, and can’t make it to the Family Nights or the Saturday morning croquet clinics, then please call or write us with any questions and to get more details about the game and our club. This summer, don’t be a sticky wicket; get off the sideline and on to the green! 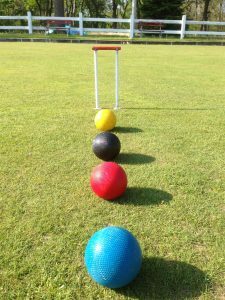 Author milwau20_wpPosted on May 30, 2016 April 9, 2019 Leave a comment on Croquet, Anyone?